Yoga (But not as you know it). Only those with headphones car hear. We are bringing you a totally unique and inspiring personal yoga experience. This is yoga, on an entirely different zen level! The Silent Yoga Disco will be suitable to all yogi’s including those who would like to try their first class. 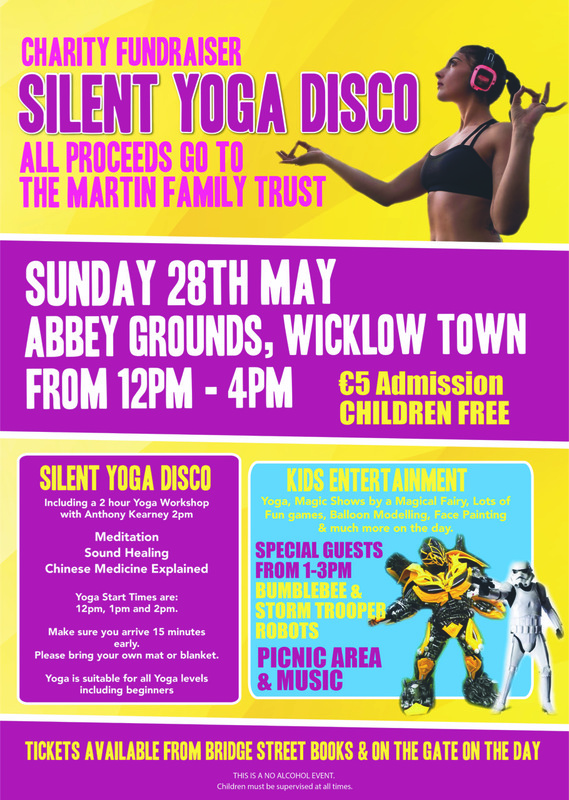 The Silent Yoga Disco start times are 12pm & 1pm. Anthony Kearney will be teaching a 2 hour workshop at 2pm for anyone wishing to explore deeper into their practice. While participants are fully immersed in their yoga practice everyone else can enjoy the hustle of a family fun day. The Storm Troopers and Bumblebee Transformer Robot will be joining us between 1pm – 3pm so don’t miss out on the opportunity to get your photo with them! With LOT’S on the the kids, including magic shows by a special magical fairy, lot’s of fun and games, balloon modeling, face painting, crafts, dance and kids yoga we are sure this will be a great day. If you like the idea of relaxing, treat yourself to a mini holistic treatment, experience a sound healing workshop, sit in a meditation session or join a talk on Chinese medicine all in the beautiful surroundings of the Abbey Grounds, Wicklow Town. We will have music and a picnic area you can sit back and relax. So many kind spirited people have happily come together to create a family fun day to support and raise money for The Martin Family Trust. We all hope you can make it down on Sunday 28th May and join us.